Gotham: Season 2 Episode 11 - "Worse Than a Crime"
Despite a few delightful moments of sinister silliness, Gotham's uneven mid-season finale is mostly disappointingly bland and melodramatic, fizzling out much anticipation for the show's return in the spring. 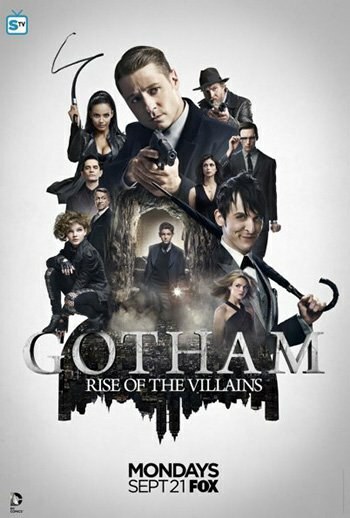 Subtitle: Season 2 Episode 11 - "Worse Than a Crime"
Rounding out the first half of Gotham’s second season, “Worse Than a Crime” is almost criminally uneven, reflecting the unevenness that has plagued the “Rise of the Villains” season all fall. The episode is similarly punctuated by a few moments of brilliance -- Bullock’s (Donal Logue) cynically witty quips, Penguin (Robin Lord Taylor) and Nygma’s (Cory Michael Smith) off-kilter Odd Couple relationship, Alfred’s (Sean Pertwee) almost slapstick physical comedy, getting buried under a heap of rubbish at the dump and getting tazed in the face -- but just like the season as a whole, it’s questionable whether these moments of delightfully dark dissonance between the sinister and the silly are enough to overcome the prevailing monotony and melodrama. For example, one would hope that Theo Galavan (James Frain) would develop into a more complex character, particularly given that he’s the primary “villain” in a season titled “Rise of the Villains”; instead, he’s rather one-dimensional, with single-minded motivations grounded in revenge, or “atonement”, as he called it last week. Although he appeared to be an intriguingly mysterious figure at the beginning of the season, in this mid-season finale, Gotham has not been able to follow through on either that or on the many other promises set up over the past few months. It's true that Galavan has been letting some of his ruthlessness crack through his polished politician’s exterior. He actually gets his hands dirty rather than letting his sister Tabitha (Jessica Lucas) do all the fighting for him; however, Theo’s apparent softness in contrast to his sister’s cruel actions in previous episodes (including an oddly pained expression in response to her callous execution of Penguin’s mother), hinting at some more complex emotions, has complete disappeared, leaving a flat, unemotional character. By contrast, Tabitha’s steely exterior seems to be softening a bit, as she rebukes her brother for being too hard on Silver (Natalie Alyn Lind), and ultimately turns on him and escapes with the girl. The Order of Dumas also turns out to be a disappointing foe. Other than an impressive ability to withstand pain, the monks are physically weak and mentally unbalanced, and they could be pretty easily taken out even by little Selina (Camren Bicondova), who’s admittedly a badass in her own right, but she’s still a young girl. Their planned ritual sacrifice of the “Son of Gotham”, aka Bruce Wayne (David Mazouz), is rather cliché and underwhelming, too melodramatic to ever really feel like that much of a real threat, especially given that viewers know that any threat to Bruce’s life cannot ultimately succeed. Selina is becoming more and more likeable, and it’s nice to see her and Alfred finally bury the hatchet, despite their mutual mistrust, Alfred suspecting Selina of working for Galavan, an accusation she swiftly denounces with an equally ridiculous and amusing allegation that Alfred could be a “Martian in a rubber suit”. Ultimately, the two discover that they are actually quite similar, bonding over their mutual affection for Bruce and exasperation at his increasingly risky shenanigans. Bruce is finally succeeding at some Batman-y manipulation and scheming, especially in tricking Silver into blowing her cover last week, but it’s important to note that his success is due in large part to Selina; her street-wise cleverness seems to be rubbing off on him. Even though this week it’s his turn to be kidnapped (a plot device that Gotham has employed annoyingly often), and Silver is ordered to continue to trick the boy into thinking she’s on his side, Bruce seems to be developing superior emotional and mental strength. The many conversations between the two are tedious and largely unnecessary, taking up screen time that could have been more fruitfully spent on more intriguing events and characters, but they do at least reveal Bruce’s ability to keep a level head in the face of death. His decision to kiss Silver as he is led to his execution seems like an act of compassion, giving Theo his wish and thereby sparing Silver from Theo’s disappointment and resulting exile from the Galavan family. It could, however, also be something of an insult, showing Silver that even though he outright admitted to feeling nothing for her, he knows he still has power over her. And what about good old Jim Gordon (Ben McKenzie)? Over the course of the past 11 episodes, he’s been repeatedly struggling with (and periodically giving in to) the temptation to “cross the line”, which is yet again a theme in this episode. Even though Jim’s inner moral conflict is really starting to get old, I’ll never get sick of Jim/Penguin team-ups, and it’s telling that Penguin is the one who advises Jim to “forget revenge” and “think of the greater good” for Gotham by taking Galavan out rather than turning him over to the authorities. Hopefully, now that he's finally unquestionably crossed the line in killing Galavan, we can finally move on to something else. Picking up on last week’s brief but exquisite treatment of the Odd Couple relationship between roommates Penguin and Nygma, the former apparently having a tendency to plug the latter’s toilet, possibly the best moment in the mid-season finale happens when Jim wakes up from a nightmare about Barbara’s (Erin Richards) fall from the cathedral (can she come out of that coma already?) to an off-kilter serenade from the two fiendish friends. Jim’s surprise at Nygma for consorting with the former crime King of Gotham is strangely modest, but his attention is quickly redirected to his own friendship with Penguin and their shared crusade against Galavan. It’s unfortunate that Lee’s (Morena Baccarin) a considerably less feisty character this week with the announcement of her pregnancy, apparently turning her toward passive acceptance of Jim’s tomfoolery. Unlike her amusing perceptiveness of some of the sloppy narrative devices we’ve seen in past weeks, pointing out how weird it is that nobody had seen the monks before despite the fact that “A, they’re killing people and carrying them across town, and B, they’re monks”, Lee’s now reduced to simply going with Jim’s plan to ship her off until things aren’t quite so “unsettled” in Gotham, even biting her tongue instead of letting him know that he’s being an idiot, something for which she’s historically known and for which she’s been applauded. Jim’s proposal’s also an eye-rolling moment, even if it does come right after he coldly kills Galavan down by the river, but even though he's apparently come to terms with a darkness inside and seems ready to move on, he still doesn't deserve her. The first half of the season concludes with some hints at Hugo Strange and Mr. Freeze, but these brief moments at the very end of the episode feel like afterthoughts, and don’t really build anticipation as would be hoped. This is perhaps because so many familiar characters have been introduced in Gotham’s one and a half seasons so far with very little payoff. Especially now that the season’s “Big Bad” Galavan is out of the picture, it’s hard to really care that it’s going to be months before we see what happens next. There’s no real sense of impending danger, and although the promise of some exciting possibilities has been set up throughout the season for Barbara, the Penguin/Nygma duo, and even Selina, if Gotham hasn’t been able to make good on those promises so far, it’s hard to keep hopes up that it ever will.